← Will The Lord Do Good And Evil? It is not easy to be told your idea is not a good one; especially when your idea was to build a house for the Lord and the prophet agreed with you. David and Nathan had decided that it was the will of God for a house to be built for the glory of the Lord and began to make plans to carry out their noble mission. Before it could begin though the Lord came to Nathan and told him the plan would not be permitted. A house would be built for the Lord but it would be done by someone else besides David. Great plans for the glory of God are great plans. What David wanted to do was a very noble and inspiring idea. The king lived in a house of cedar yet the ark of the Lord was dwelling in a tent? This should not be. But neither was the plan of David. What makes this a great story is how the king reacted to being told he could not build a house for the Lord. He did not argue, he did not pout and he did not go ahead with his plan. The statement of David should be read often. Listen to the tone of this humble servant of the Lord when He says, “Who am I, O Lord God?” What greatness David exhibits. The power of a contrite heart to obey the will of the Father shines forth in the praise from David’s lips. He exalts the name of God by declaring there is none like his God. The people of God are the greatest people in all the earth. He is only a servant to obey the wishes of his heavenly Father. The Lord makes promises to David that will not be fulfilled in his lifetime. God’s house will be built by another and the king declares the word of God establishes truth. 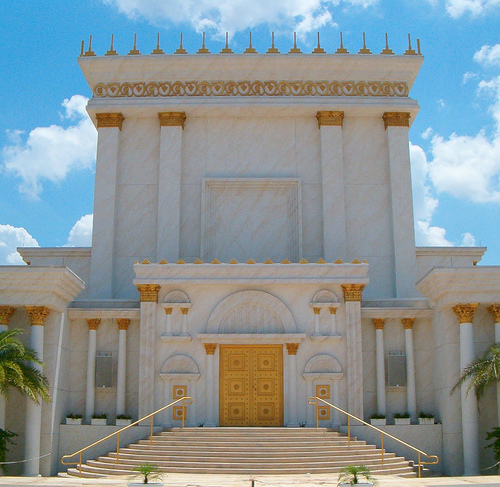 The remaining part of David’s life is spent in preparing the materials, labor and divisions for the building of the Temple. Read again our text for the day and drink deeply from the spirit of a man of God expressing his simple delight in doing the will of the Father. We would do well to seek after the example of David with such a beautiful spirit and love for God. Too many times, we want to argue with God. We do not trust the Lord enough. Life is about what we want and desire instead of what the Father has patterned for our lives. Trusting in the Lord is allowing His word and His word alone to be our path. David had a wonderful idea but it was not the will of God. The reaction of the king is what makes this a great story. Thank you David for your witness of faith. Let all of us strive to model our life in the fashion of the sweet psalmist of Israel and trust in the will of the Lord.